Helmet Fresh® is a unique product that eliminates odor at its source. Most offensive odors in a helmet come from bacteria, mold and mildew that accumulate over time. 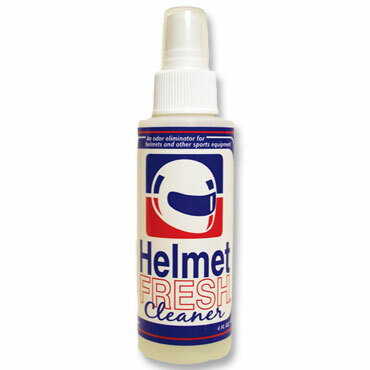 Helmet Fresh® eliminates these odors by killing the organisms that cause the odors. So it can be used near skin and hair without irritation. It contains no alcohols or oils. This fact sets it apart from any other product on the market. Since it contains no alcohols it is safe for use on all plastic surfaces, including foam rubber and vinyl helmet liners. Helmet Fresh® does not contain any compressed gas propellants. The convenient 4-ounce spray bottle fits in most motorcycle storage compartments or fanny packs with ease. It's not a fragrance or fragrance-based deodorant. Instead of covering up the odor Helmet Fresh® eliminates it. Regular use will keep odors from returning and maintain the fresh, clean “smell” of odorlessness. Accept no imitations! 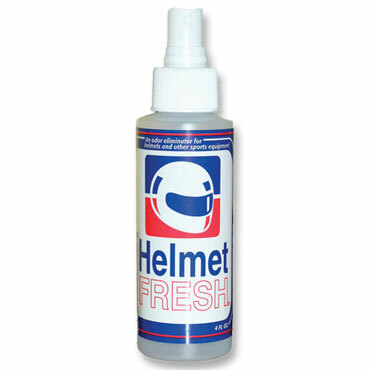 While others have tried to copy Helmet Fresh®, nobody has duplicated it. To make sure you have the genuine product look for the Registered Trademark. Only the highest quality ingredients go into the manufacture of Helmet Fresh® making sure you will receive the highest quality product available. In fact, anyone who wears a helmet, hat, ballistic vest, or uses a sleeping bag, camper or duffle bag should use Helmet Fresh®. Convenient 4 ounce bottle with plastic finger pump spray. Made in the USA.